On the subject of living a life on purpose, passion and peak performance, nobody tells it better than Zig Ziglar. 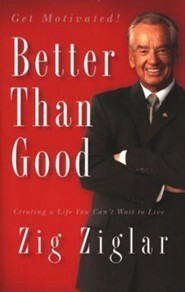 In Better Than Good, Zig goes several steps beyond other "success" books by not only helping the reader get motivated, but stay motivated by confronting and transforming the things that stand in their way. Written in Ziglar's trademark style, this book isn't just about success now, excellence tomorrow or even motivation for next month, but about making a lasting impact - an impact that goes beyond financial gains and creative partnerships. Everything we are and do, he says, must be seen in the bigger perspective of continuously investing your spirit, mind and spiritual vision for what life can be when we allow the power of purpose and passion to permeate our soul. He has spent his life helping other people to realize their dreams and experience maximum success. Now comes Zig Ziglar's high-impact work that calls you to the passion, purpose, and practical tools that can ignite the peak performance you long for. ways to form better-than-good habits that can take you to new horizons of success . . . and much, much more! Let the master of motivatin help you clear your mind of failure-prone thinking, as together with Zig Ziglar, you redefine success and take hold of your dreams. Let him inspire you to be Better Than Good! 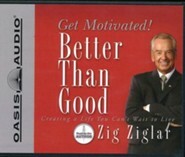 Zig Ziglar, one of the most sought after motivational speakers in the United States, offers a message filled with humor, hope and enthusiasm for audiences around the world. Many of the books he authored have become worldwide best-sellers. Now 80 years old, motivational writer and speaker Zig Ziglar is still teaching his same message of the past 45 years, but this time with a much stronger emphasis on his relationship with Jesus Christ. 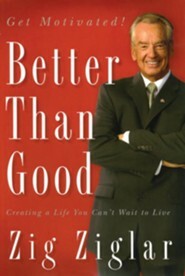 In Ziglar's new book, Better Than Good: Creating a Life You Can't Wait to Live, we get the usual fare from this writer. There are lists of things to do in order to set and reach goals, improve integrity, enhance one's marriage, and do a better job at work. There are also endless stories of people who overcame great odds to become champions in their areas of expertise. And there are also stories of losers, such as the man who let Bill Gates be the first to market MS/DOS and, thus, missed a chance to become a billionaire. This is fun reading and exactly what we've come to expect from Ziglar in book after book, speech after speech, and training film after training film. No surprises there, and, in fact, he freely admits in several of the chapters that he is reprinting material from his earlier books, or material he has been given permission to reprint from other writers' books. However, now writing for Integrity Publishers rather than some of the secular imprints his books have appeared under previously, Ziglar openly tells of his conversion to Christianity, his witnessing to his brother and friends and business colleagues, his favorite Bible verses, and his prayer life. He bluntly states that his relationship with Jesus Christ is the most important thing in his life, and he encourages everyone to find this same Savior. He even goes so far as to say that a good life--even if it is "better than good"--will not get anyone into Heaven. Only knowing Jesus as Lord will do that. I'm the author/artist and I want to review Better Than Good: Creating a Life You Can't Wait to Live - eBook.